I do love encouraging wildlife into the garden; isn’t it great when something decides to take up residence in your patch? 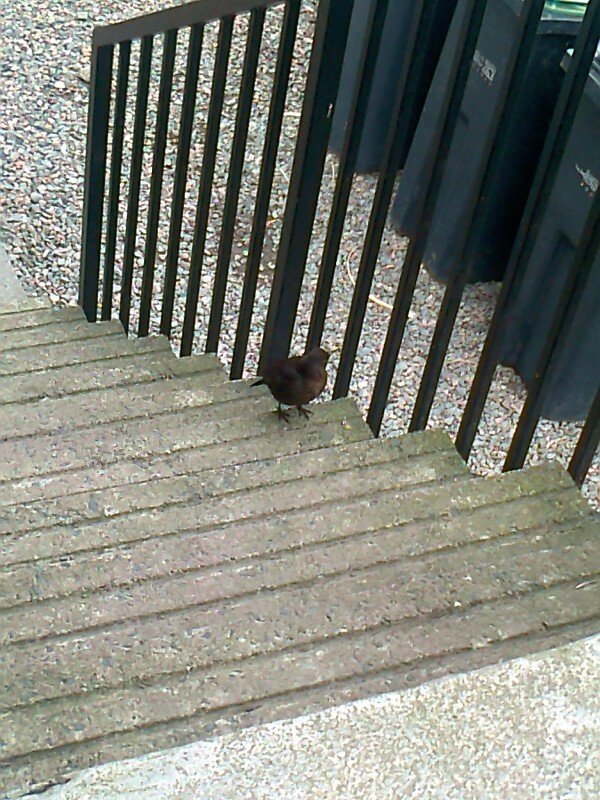 We have a family of blackbirds who’ve now nested here for two years running, giving us a glimpse into the busy schedule of blackbird family life right up until the chicks are fully fledged and leave home. A large wood pigeon has also taken up residence letting us watch as it flies to and fro, landing awkwardly in the neighbours’ tree to build its nest. A whole range of little songbirds have nests dotted about the hedges next to our fence and it’s such a delight to have them all literally on our doorstep. The mini meadow my boys sowed with a ‘creepy crawly’ mix is doing a lot better than we expected so hopefully it’ll encourage more bees and butterflies once it’s in full flower giving them a nice boost of nectar while they zoom about on their daily business. I must admit that sadly so far this year I’ve only seen five bees, two of which were on the ground unable to take off. Being the softy that I am, I gently put them onto an empty pot and held it aloft until they were able to take off. I can only presume that maybe it was the wet weather that grounded them? It worries me to see that there’s hardly any going about and I aim to have more bee friendly plants put into the garden wherever I can squeeze them. I haven’t seen many butterflies either and it’s such a shame; I’m missing seeing those elegant little creatures fluttering about. They’re so gentle and so beautiful – here’s a picture of one we saw last year; it was stunning. I think we should all have a little bit of our garden laid aside for wildlife. Last winter we had a few hedgehogs and what funny little critters they are! I remember hearing these bizarre noises when it got dark so I went out to investigate, finding the culprits to be a couple of chubby little hedgehogs. I have no idea if they were being territorial or anything but my goodness they were noisy. We once found one that had been getting worried by an overly curious dog so after checking it over for any injuries we kept it warm, quiet and calm then put it into a sheltered bit of the garden to be rewarded with the sight of it toddling off quite happily stopping to munch a few slugs on the way. I’m hoping to see more this year and will be embarking on a wee project with the boys to make a little hedgehog hideaway. The boys absolutely love having any form of wildlife in the garden and it’s great fun doing little things to help. We really want a frog or toad to visit, our neighbour found one the other day when she was moving a pot but we missed out on seeing it. Do you get any wildlife visitors in the garden? It’d be nice to hear about and if you have any tips on encouraging more my boys and I would like to try them.